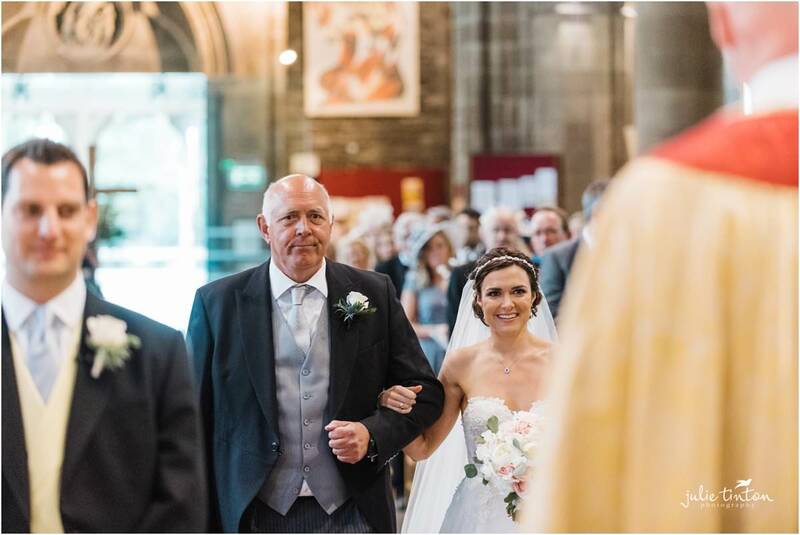 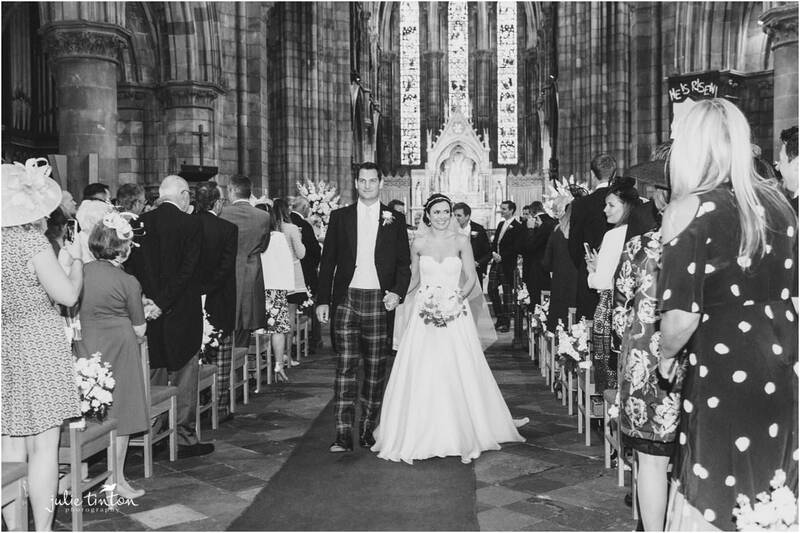 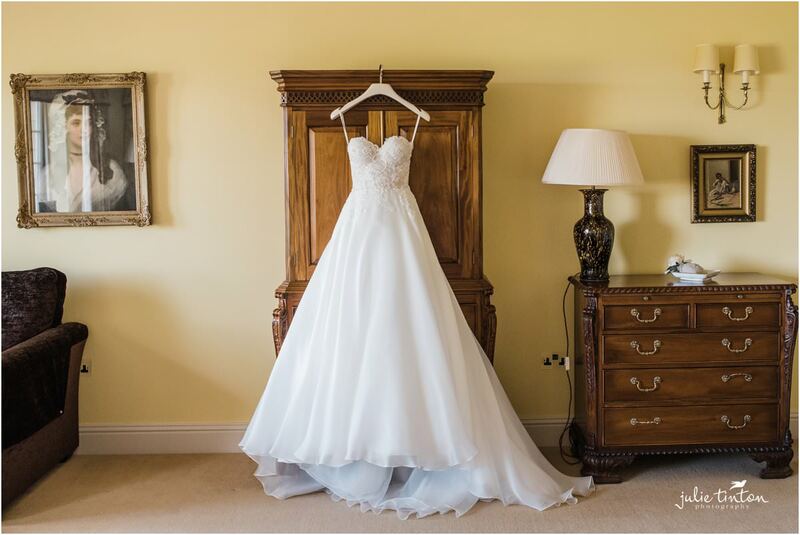 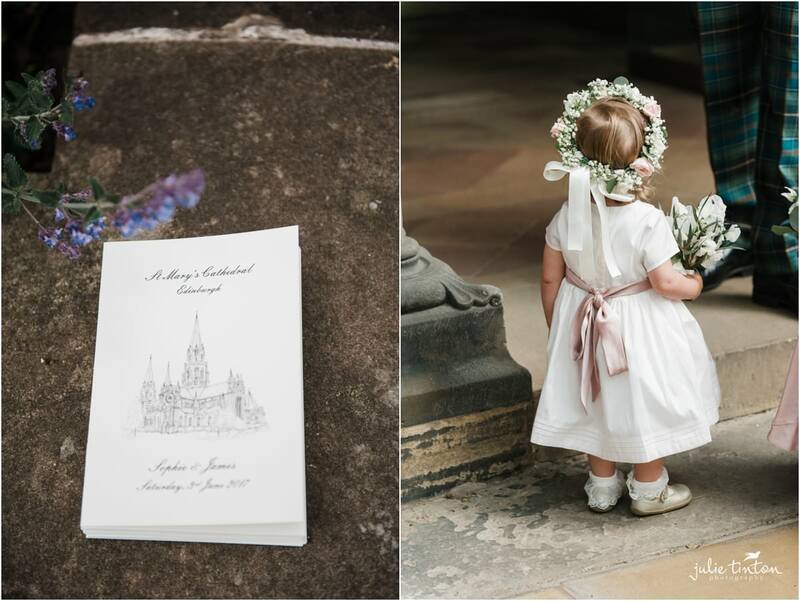 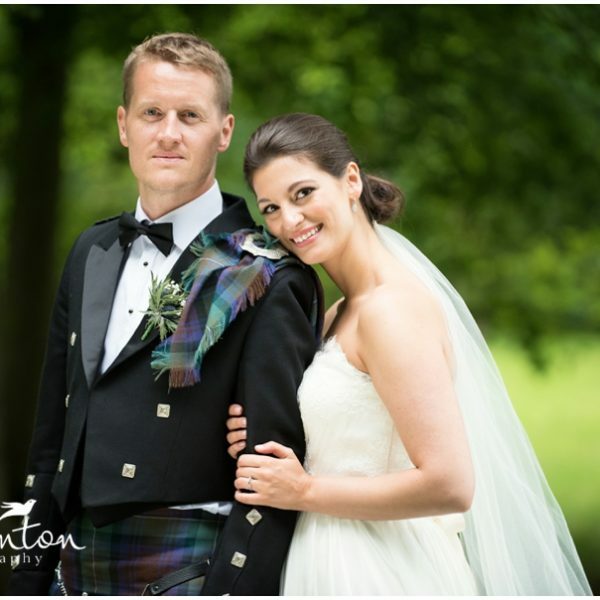 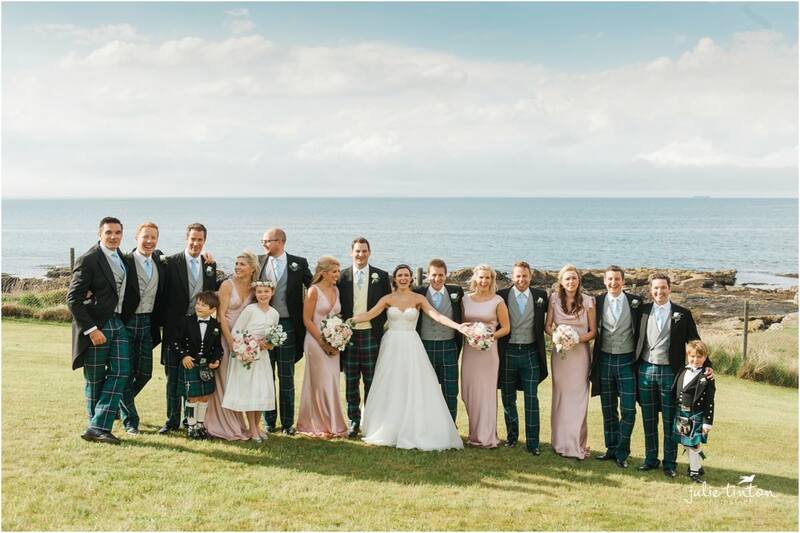 Waterfront at Archerfield Wedding – Sophia and James! 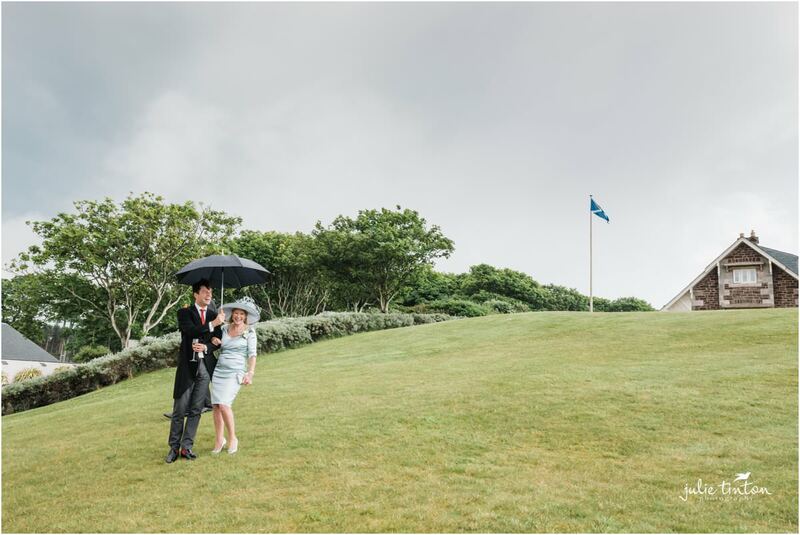 If anyone ever asks me ‘what happens if it rains on my wedding day?’ I’ll show them Sophia and James beautiful Waterfront at Archerfield wedding. 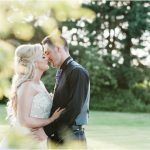 Even the ducks came out to celebrate! 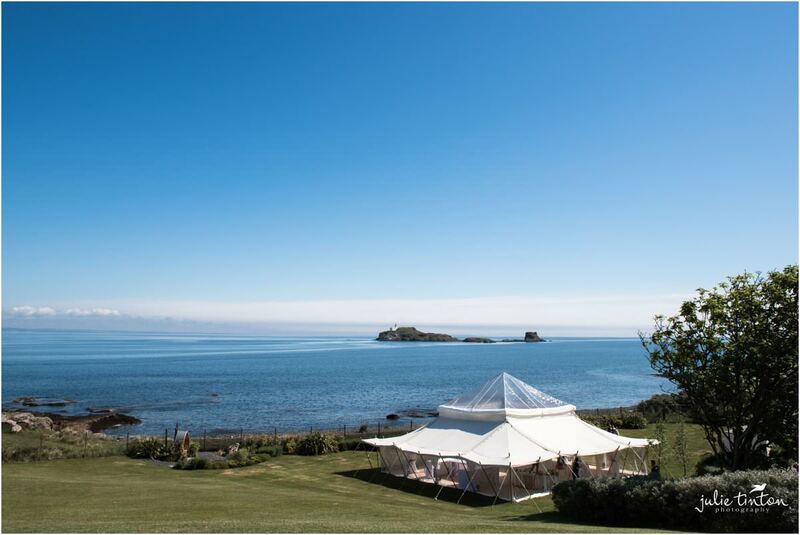 Archerfield House Waterfront Pavilion in North Berwick, is set in 28 acres of land looking out on to the Firth of Forth, it is a stunning wedding venue and one of my favourite venues, not only because of the stunning landscapes but is perfect for all weathers with a magnificent marquee atmosphere. 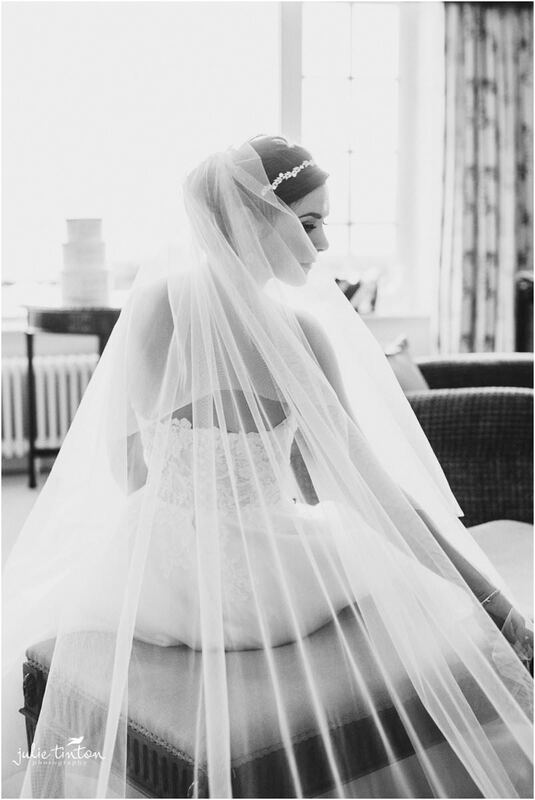 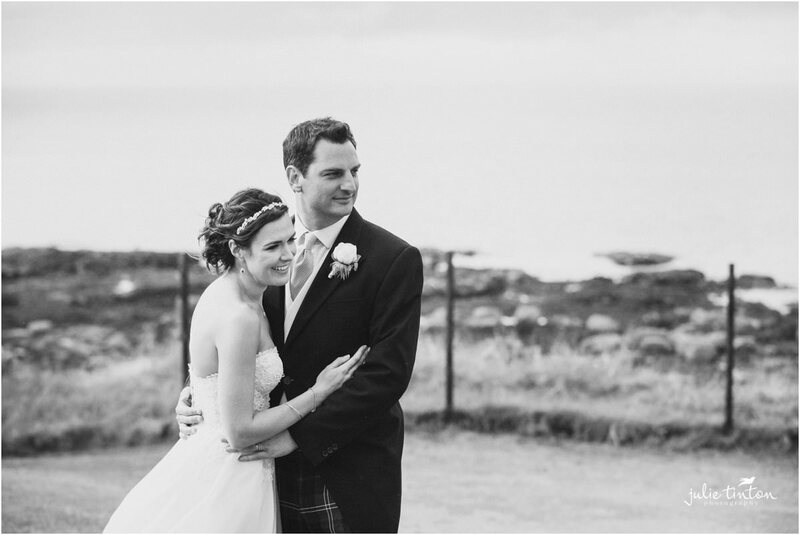 On the morning of the wedding, I met beautiful bride Sophia at the Marine Villa on the grounds of Archerfield. 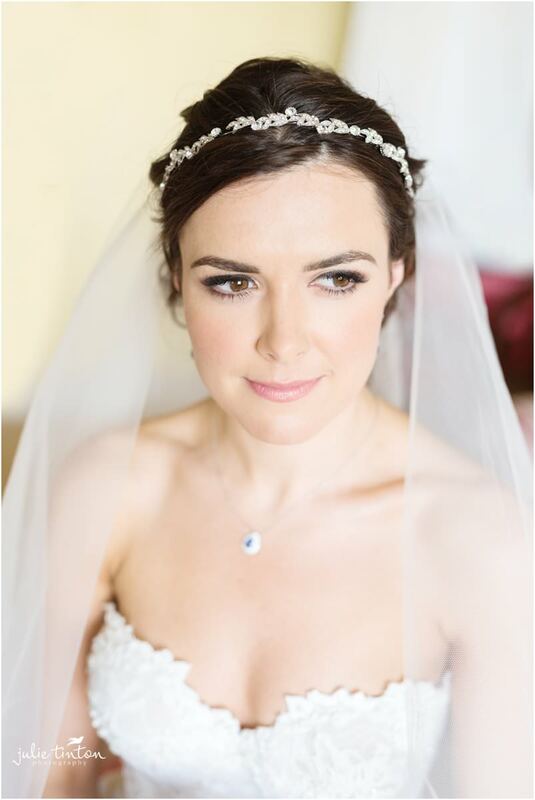 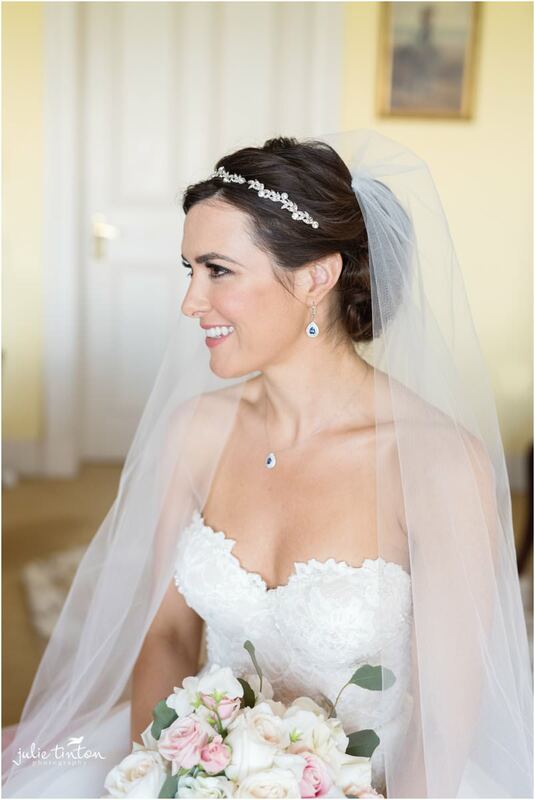 As I arrived, Sophia was right in the throws of bridal prep having her makeup done by super talented Lauren Gollan. 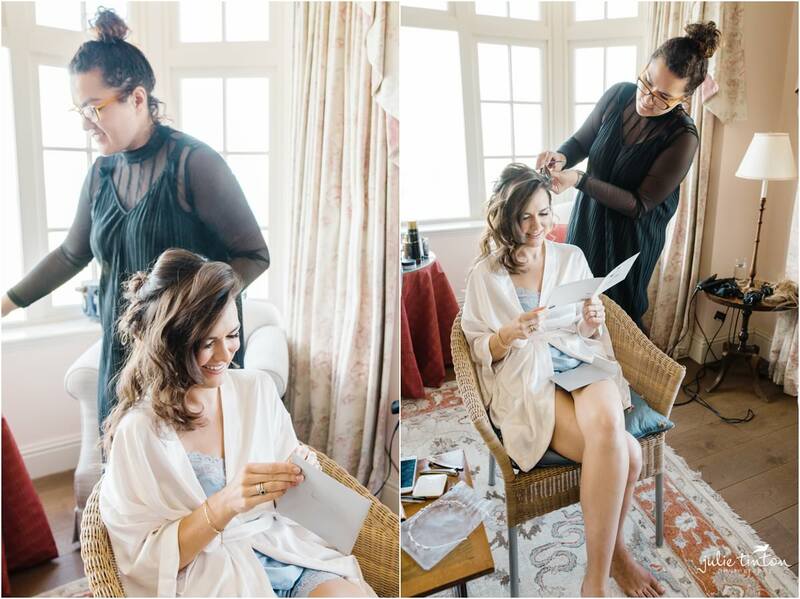 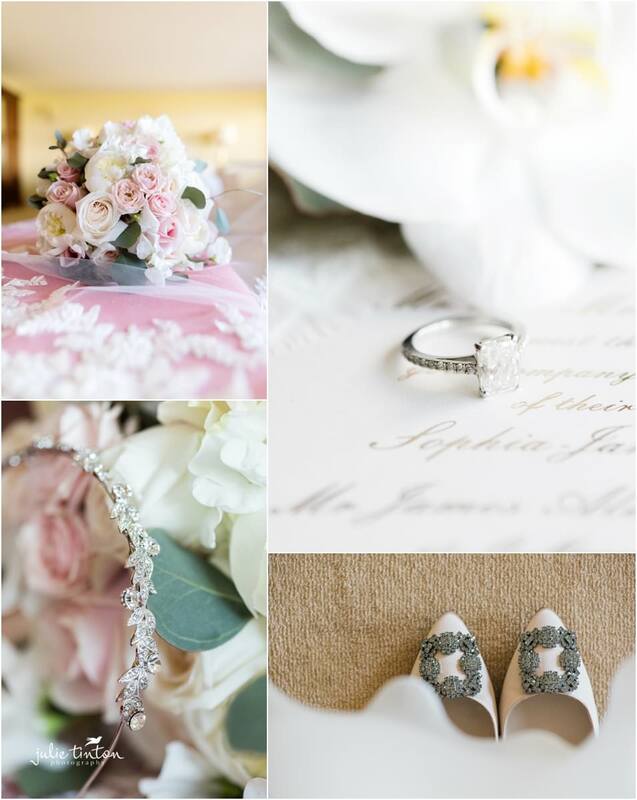 I wandered around documenting the prep and all the stylish details, from her beautiful Caroline Castigliano dress, shoes and gorgeous flowers. 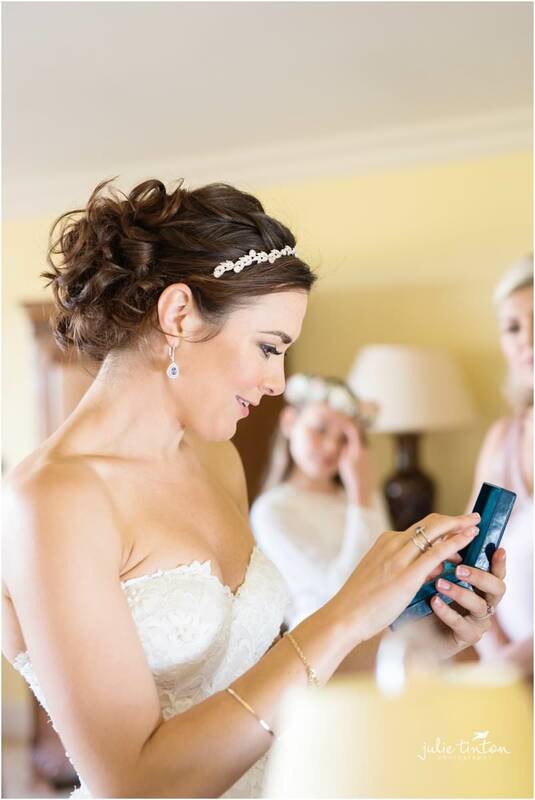 While Sophia was getting her hair styled, she opened a lovely card from her soon to be husband along with a beautiful earrings and necklace set. 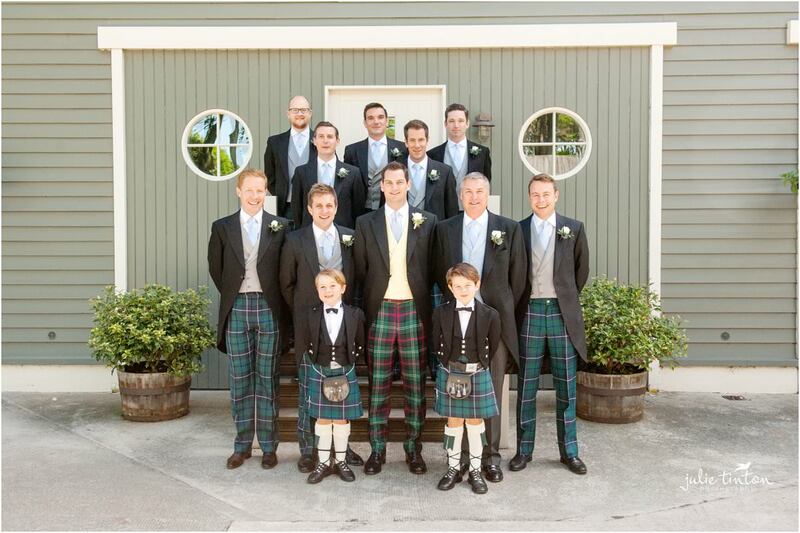 James and the boys were photographed in the Boat House and down at the Waterfront. 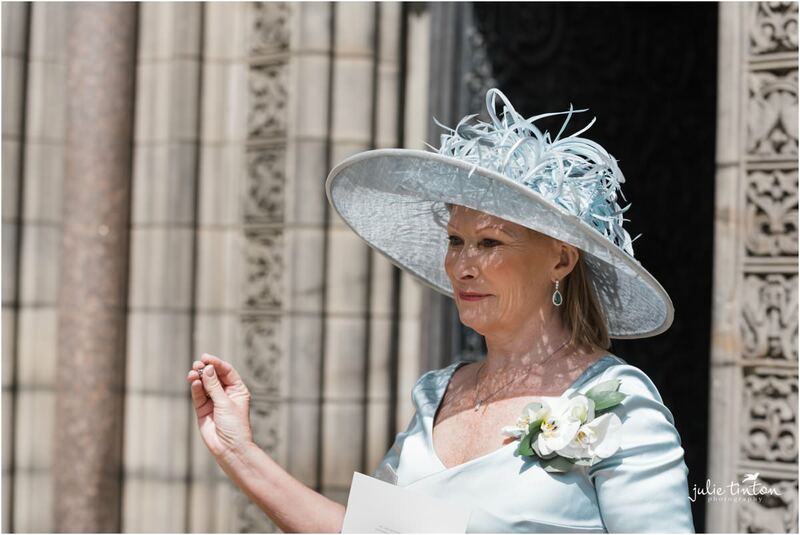 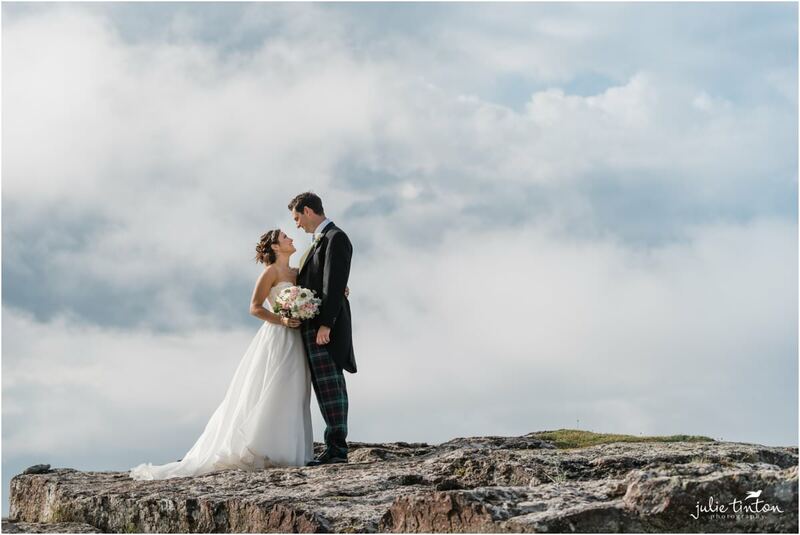 Luckily, the sky was a brilliant blue and we captured some really lovely portrait shots, a mixture of formal and relaxed. 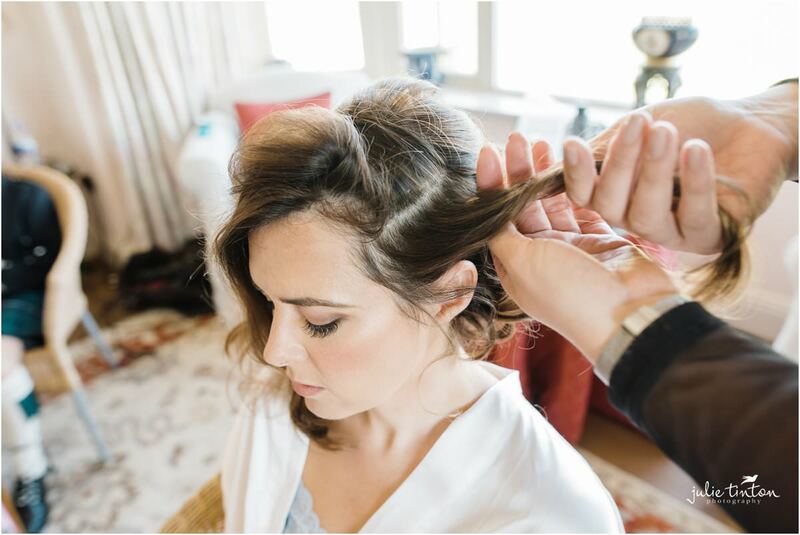 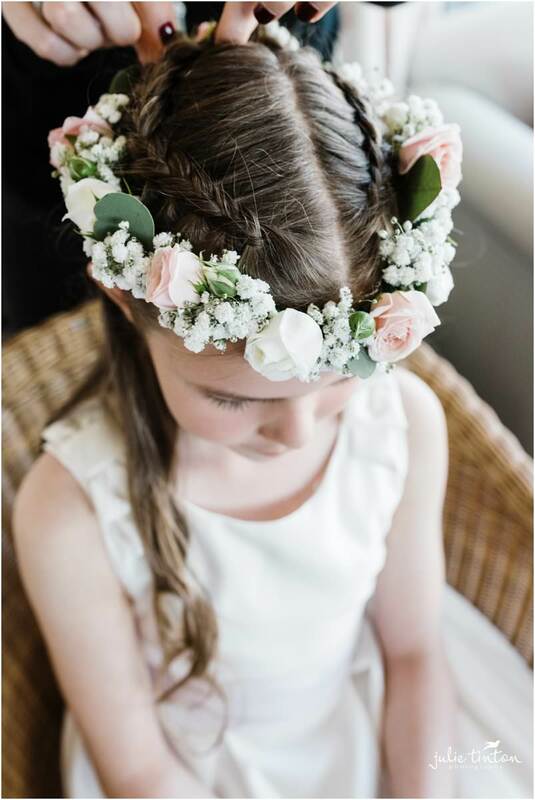 Back at the villa, Sophia, her four bridesmaids and two beautiful flower girls were putting together the final touches. 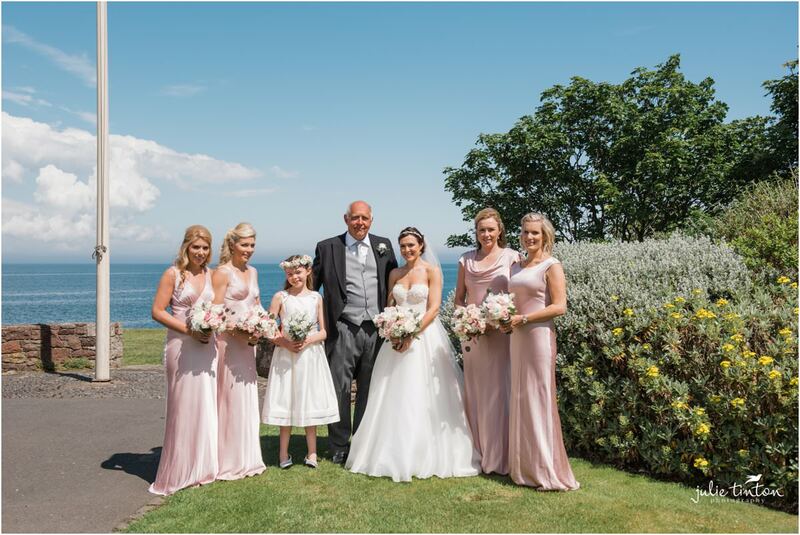 Once perfected, we took to the sunshine to get some photographs of Sophia with her bridesmaids and her Dad, before heading off to the cathedral in Edinburgh. 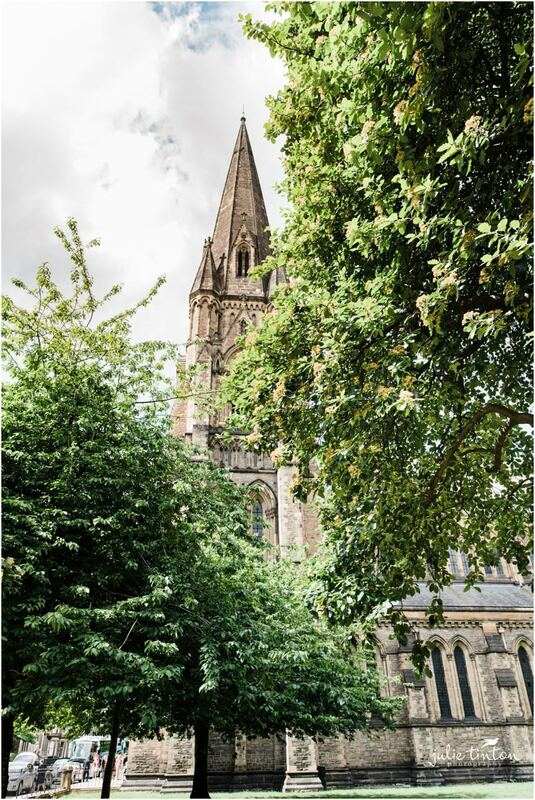 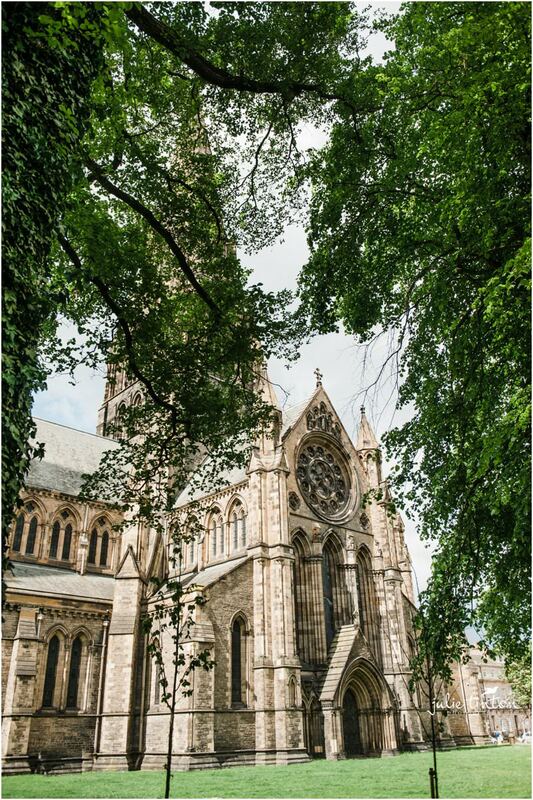 The cathedral was the beautiful St Mary’s Cathedral in Palmerston Place located in the Westend of the city. 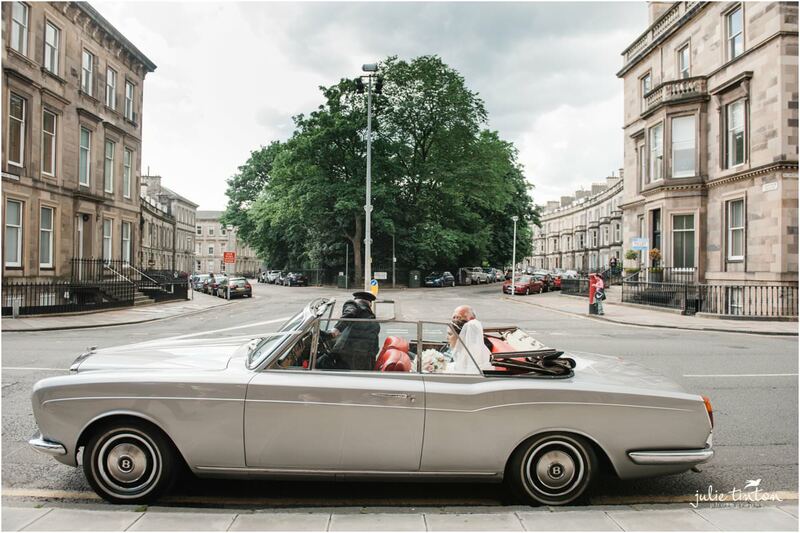 The bridesmaids arrived in style in a Tesla Premium electric car, and Sophia followed with her dad in a Rolls Royce. 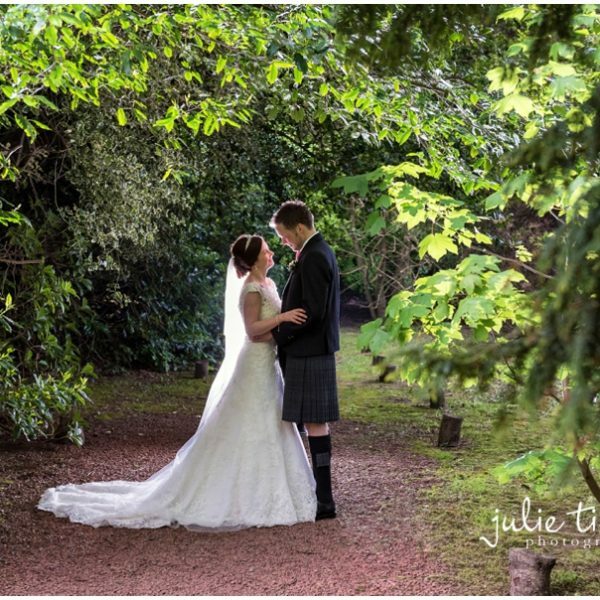 The rain stayed off and the ceremony was lovely. 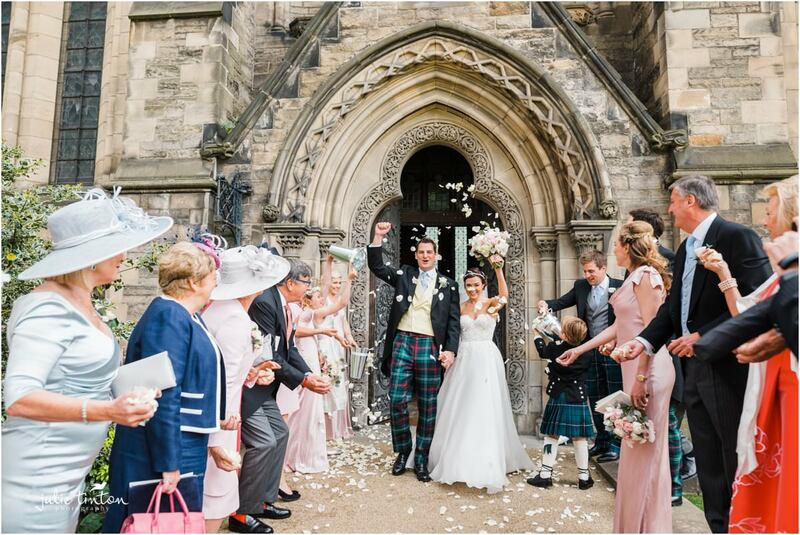 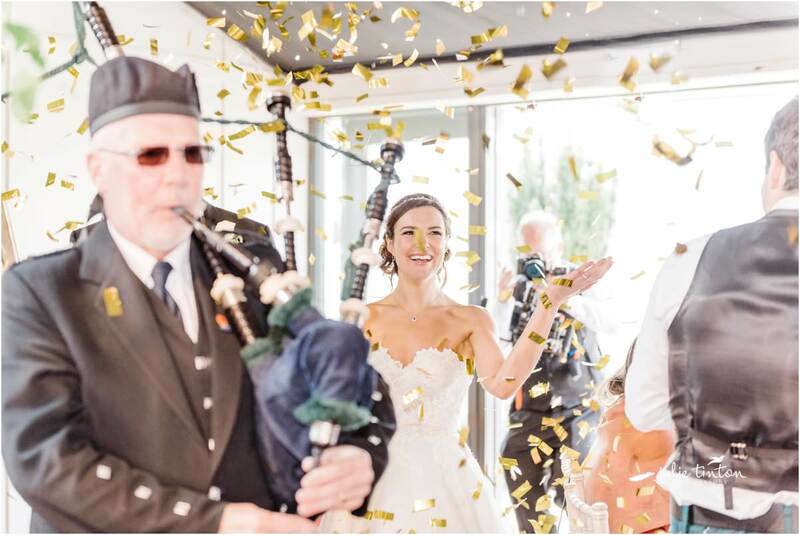 Sophia and James exited as Mr and Mrs to a rose petal confetti tunnel, and we all headed back to Archerfield for the reception. 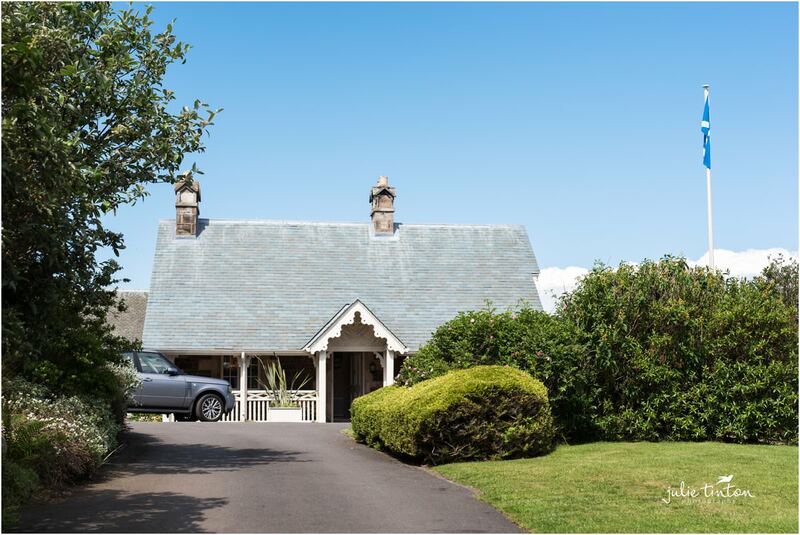 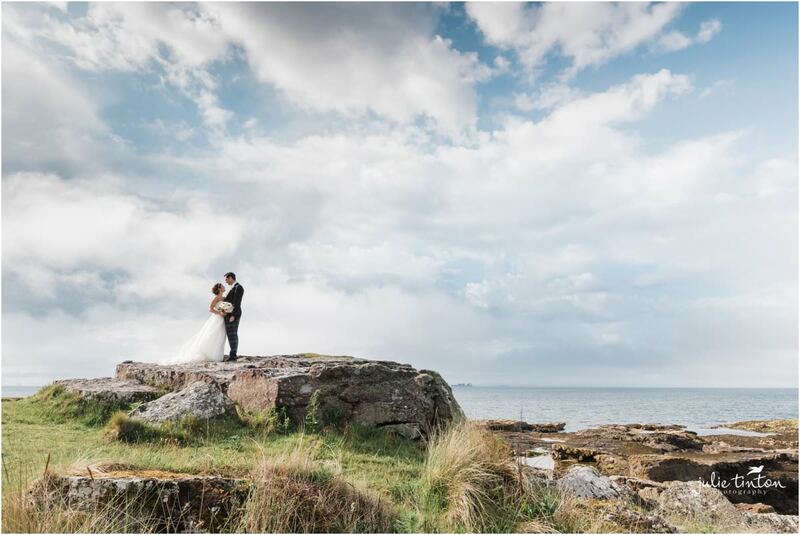 Arriving at Archerfield, we planned a shoot by the lake, but the weather had other ideas. 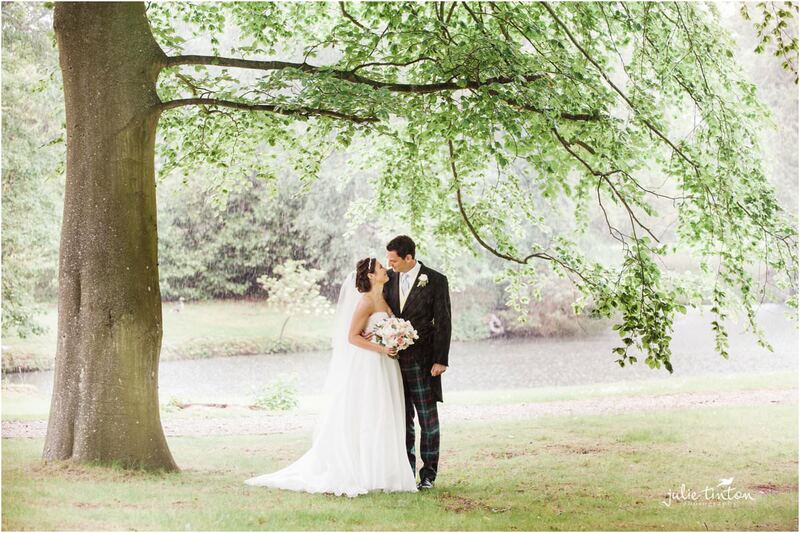 Nevertheless, Sophia and James embraced the downpour, surrounded by the ducks, which made for some brilliant photos. 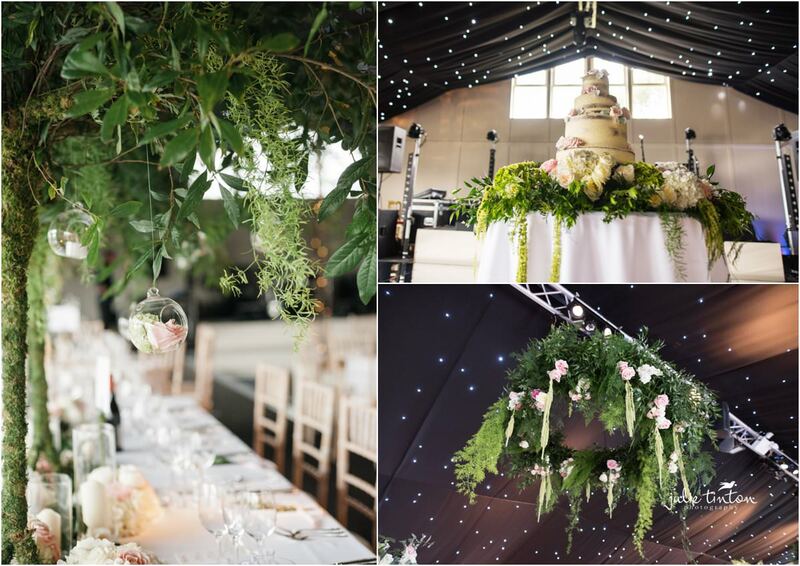 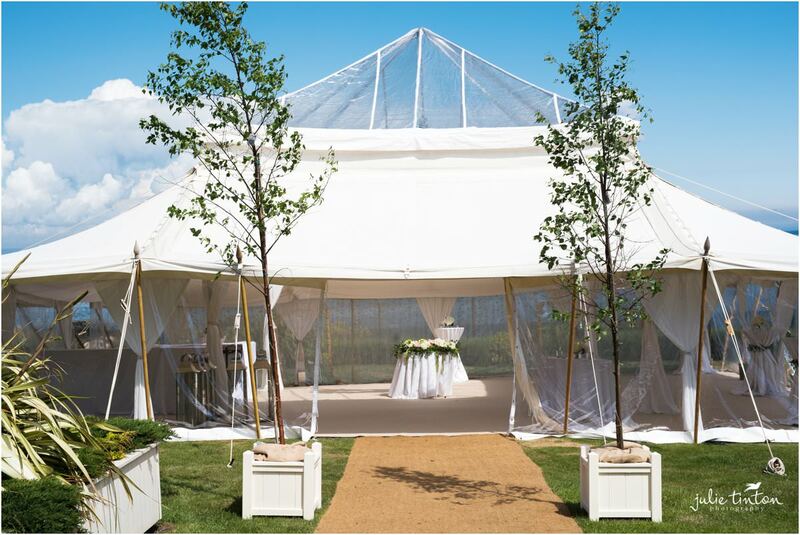 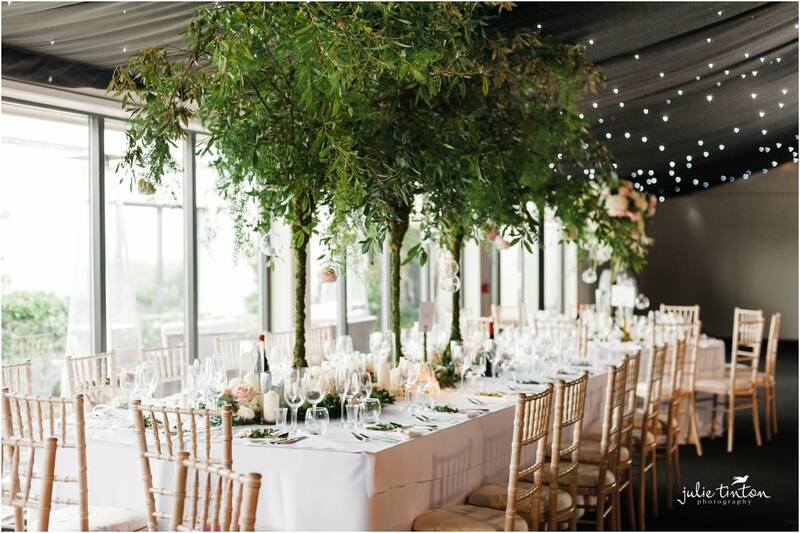 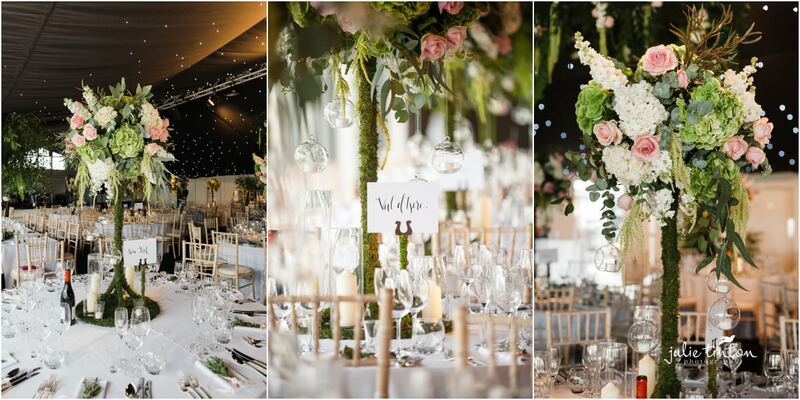 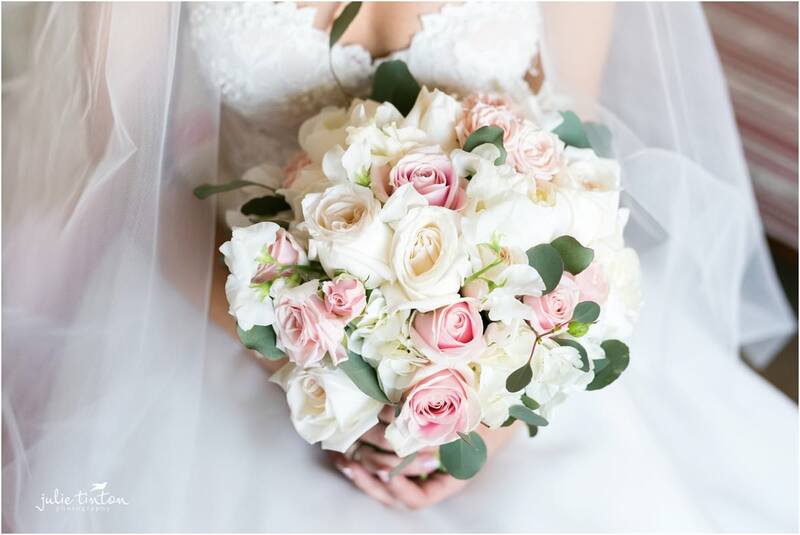 Back inside, the marquee had been styled to perfection by Planet Flowers, we just loved all those stylish details and beautiful floral arrangements. 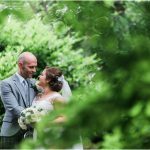 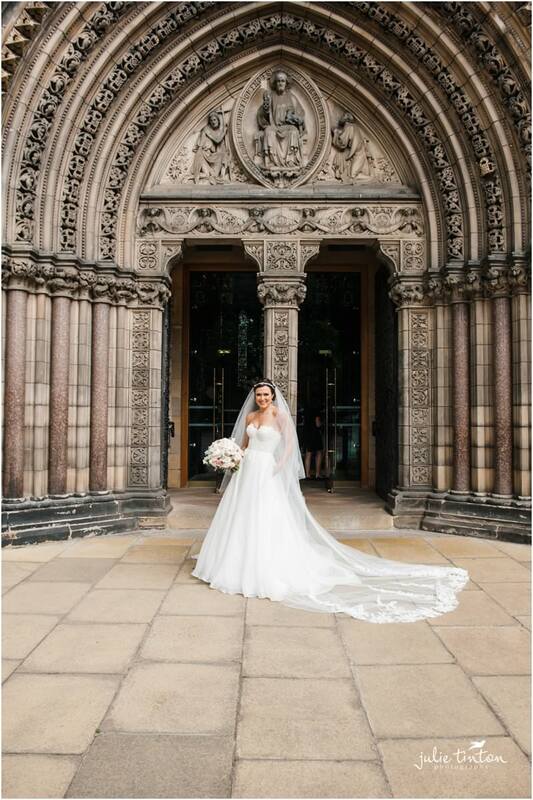 While the guests were enjoying the reception, we waited for breaks in the rain and darted outside for some romantic shots when the sun made an appearance. 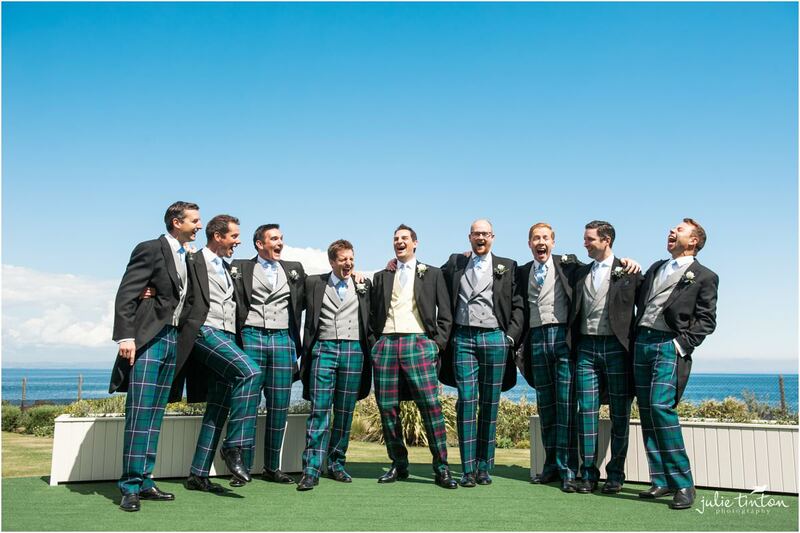 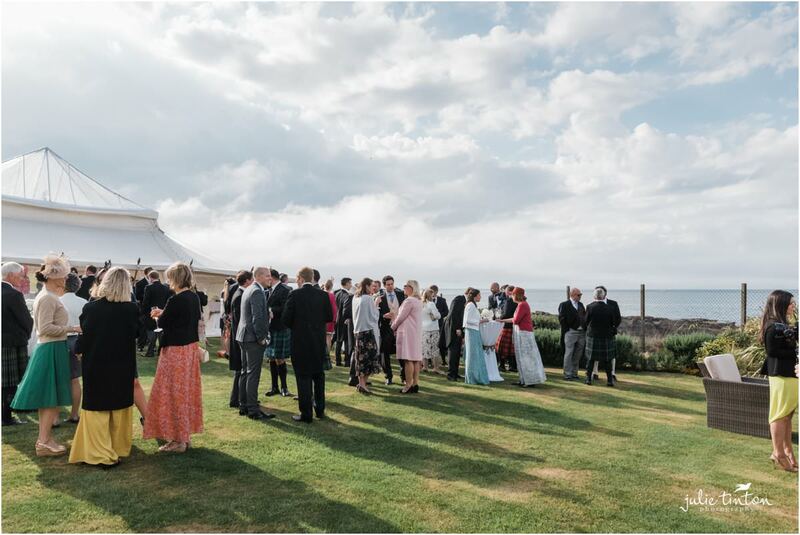 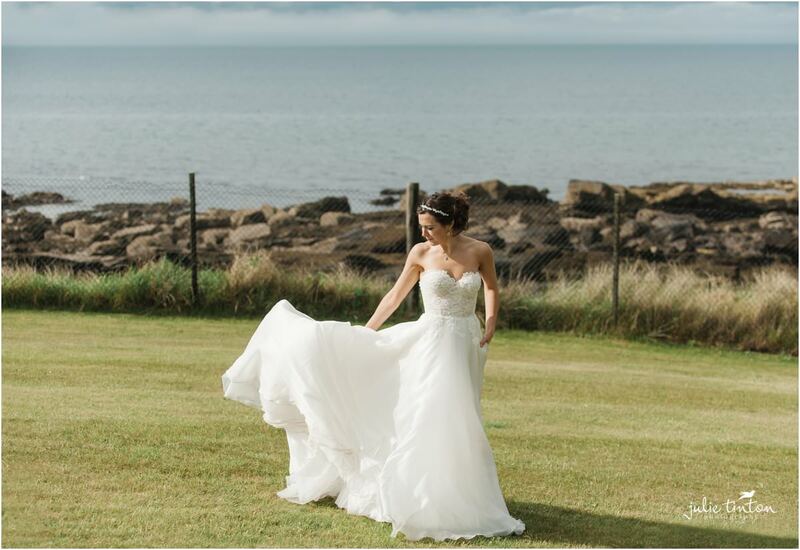 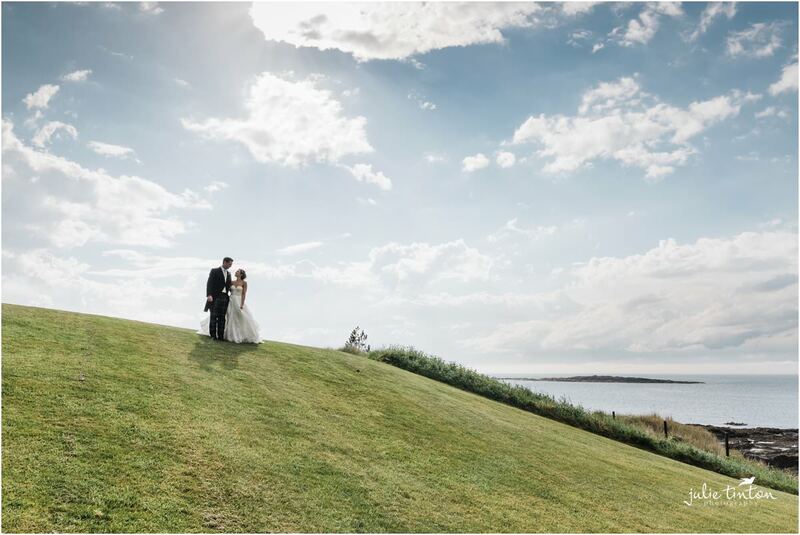 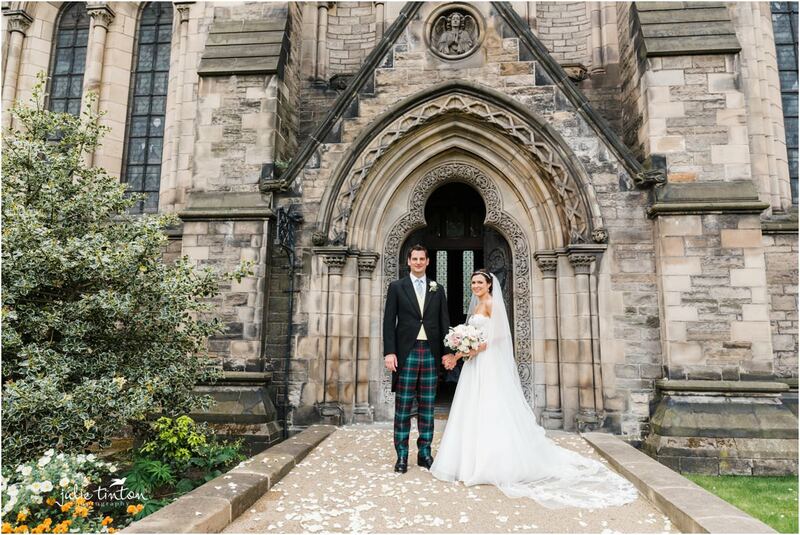 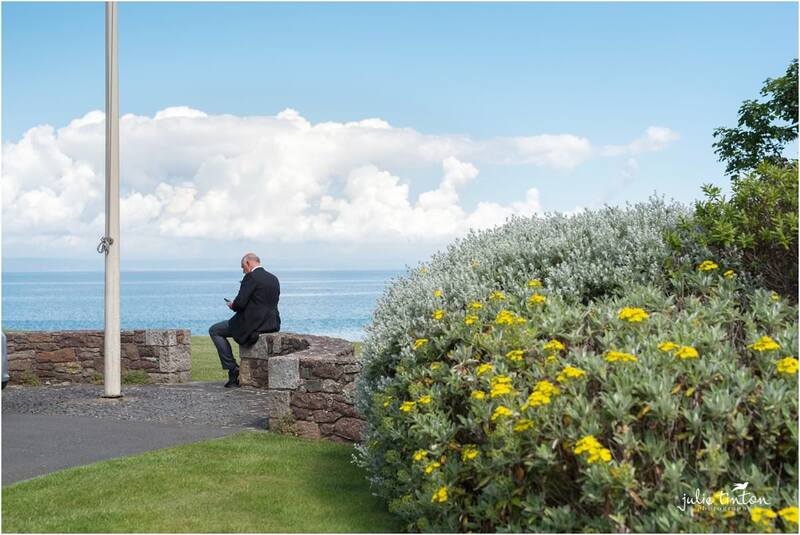 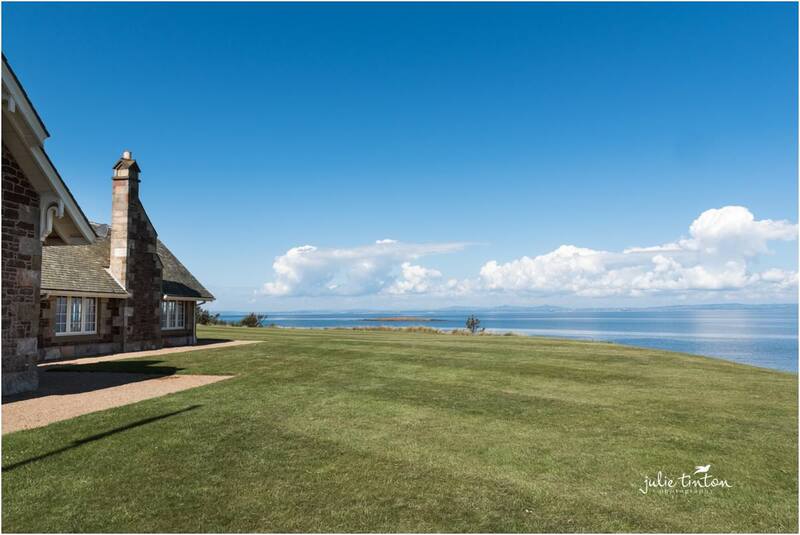 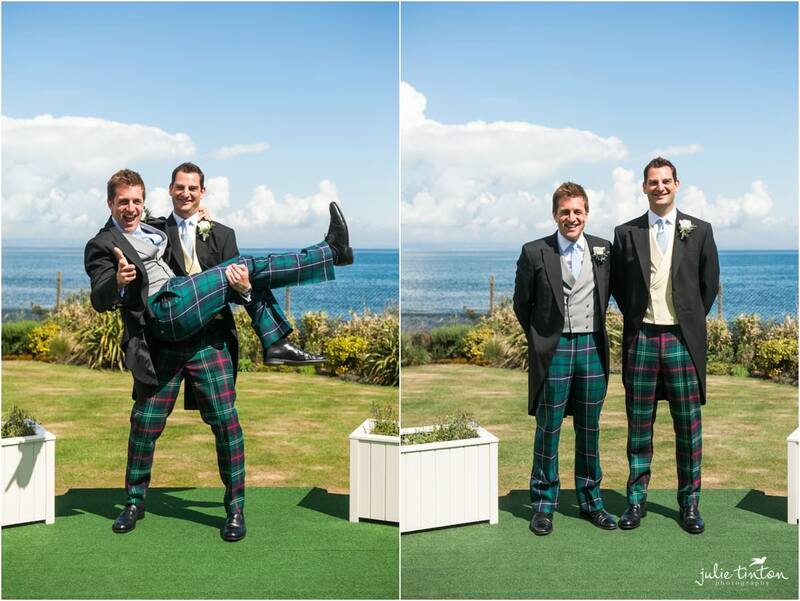 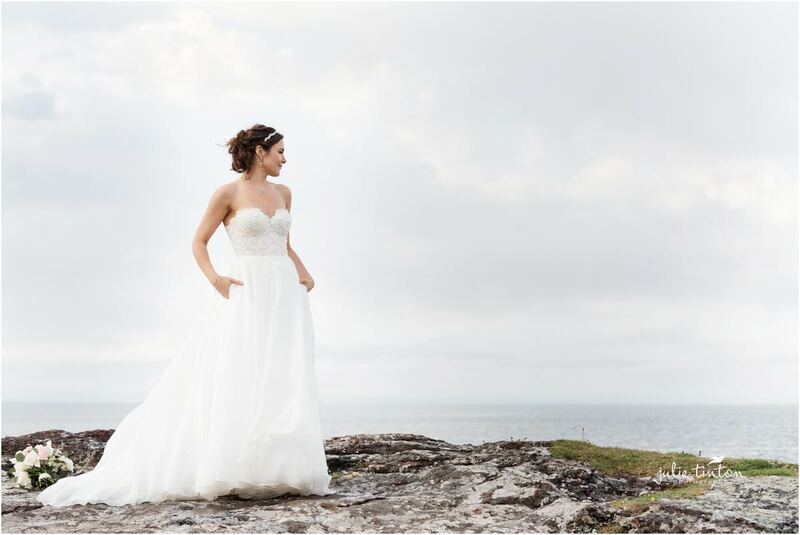 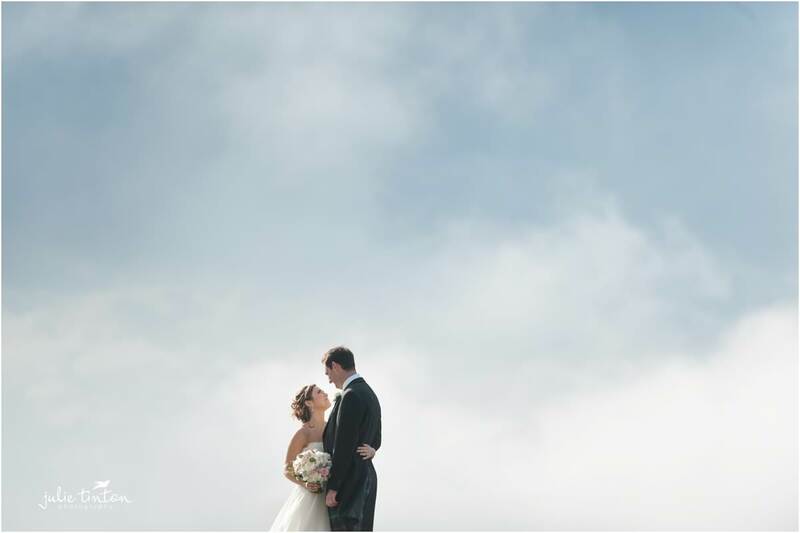 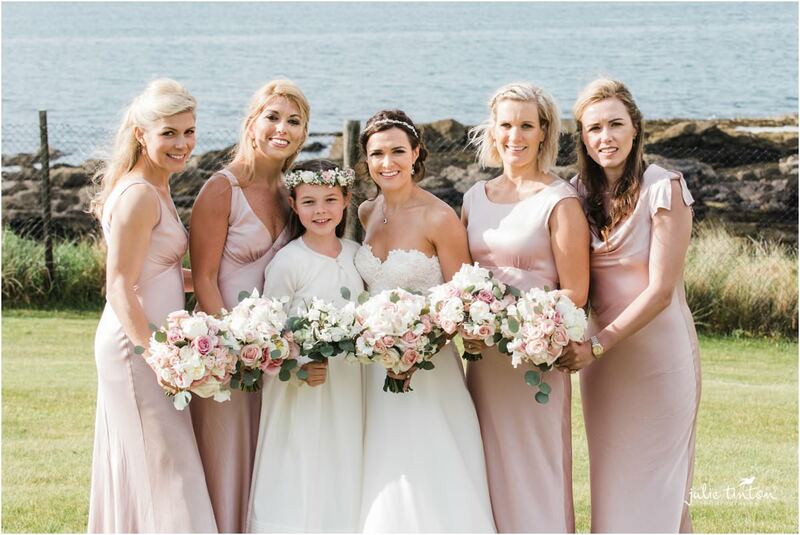 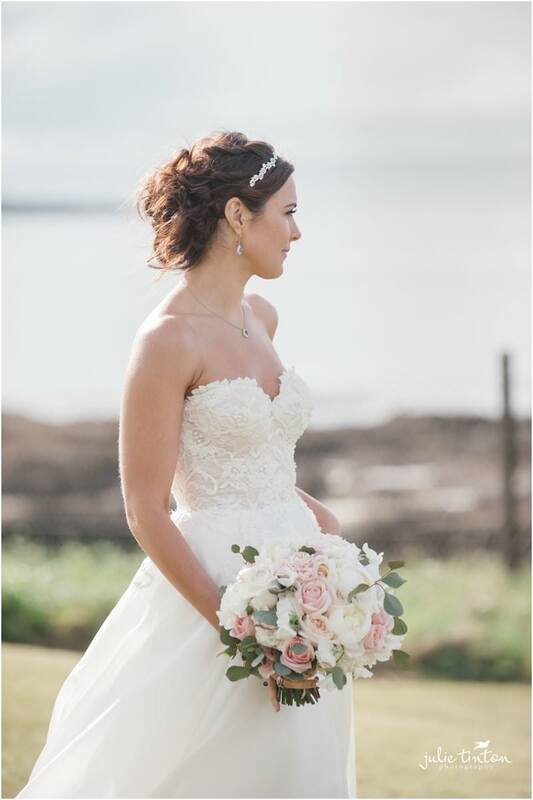 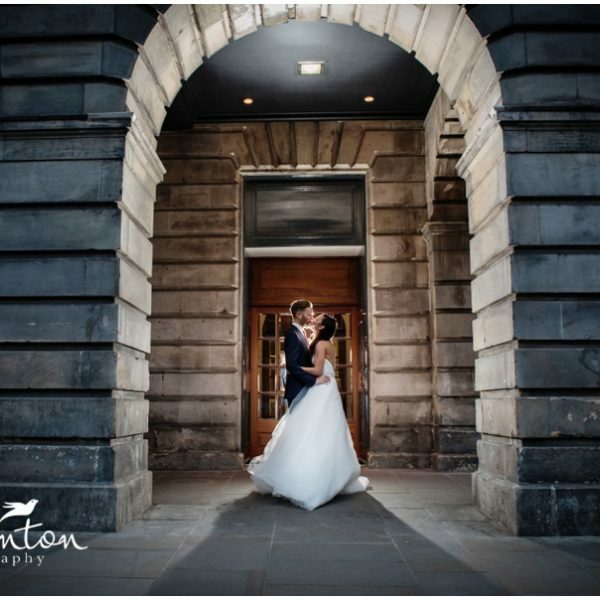 The Waterfront at Archerfield House makes for a stunning backdrop to the photos despite the on and off weather. 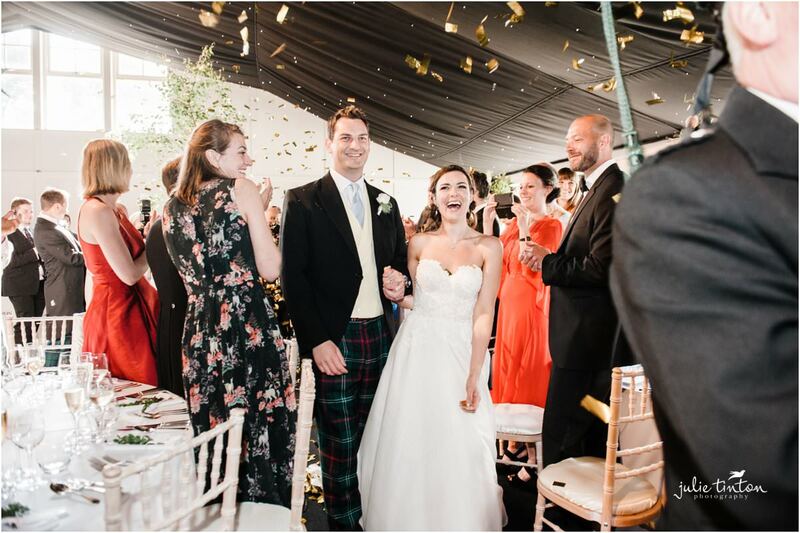 Sophia and James made their entrance for dinner to a wonderful confetti cannon before everyone settled down for the speeches. 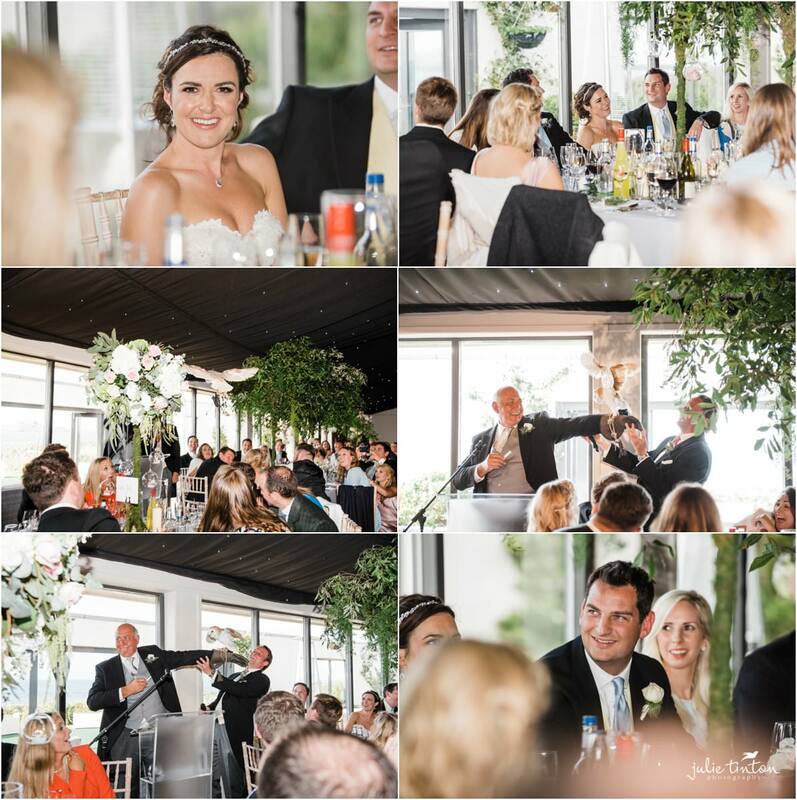 As a surprise an owl had been organised to deliver the speech for Sophia’s dad, he certainly made an entrance! 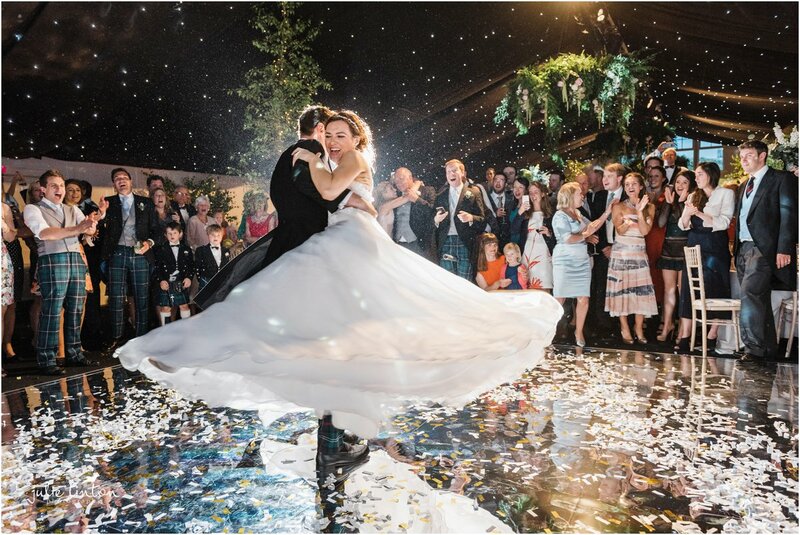 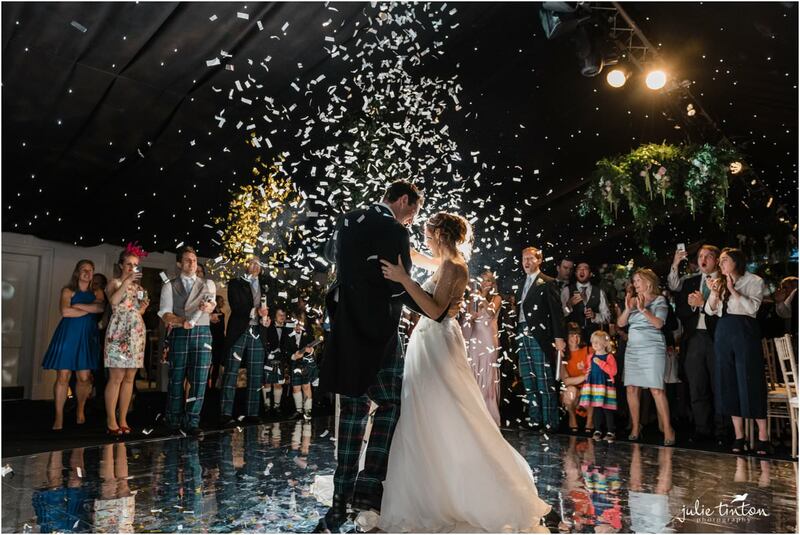 The speeches and food were wonderful and afterwards, Sophia and James took to the dance floor for an amazing choreographed first dance under another fantastic confetti cannon when the party started! 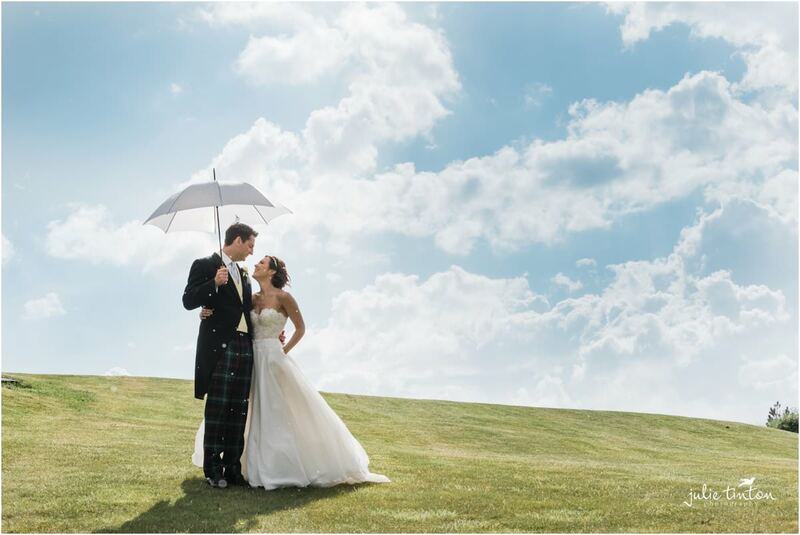 I hope that Sophia and James’ photos prove that there’s no need to worry about the weather on your wedding day. 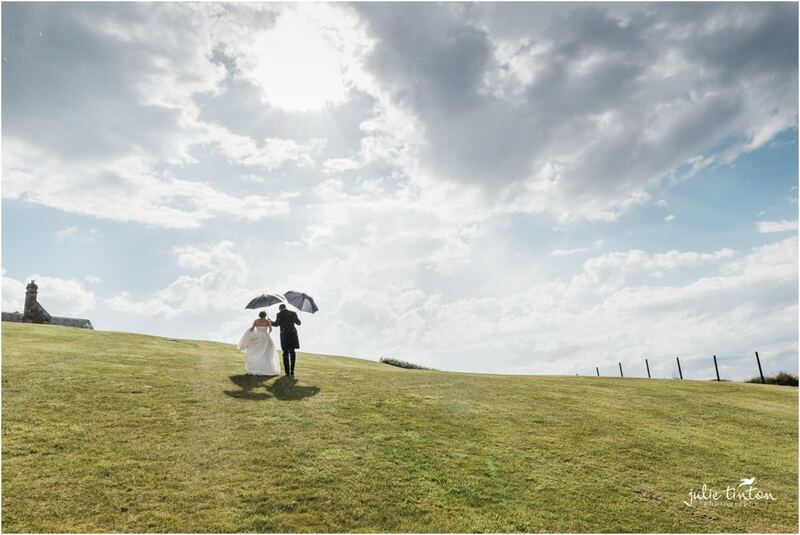 A tip from me would be to plan for rain as well as sun, and choose a venue that can cater to both. 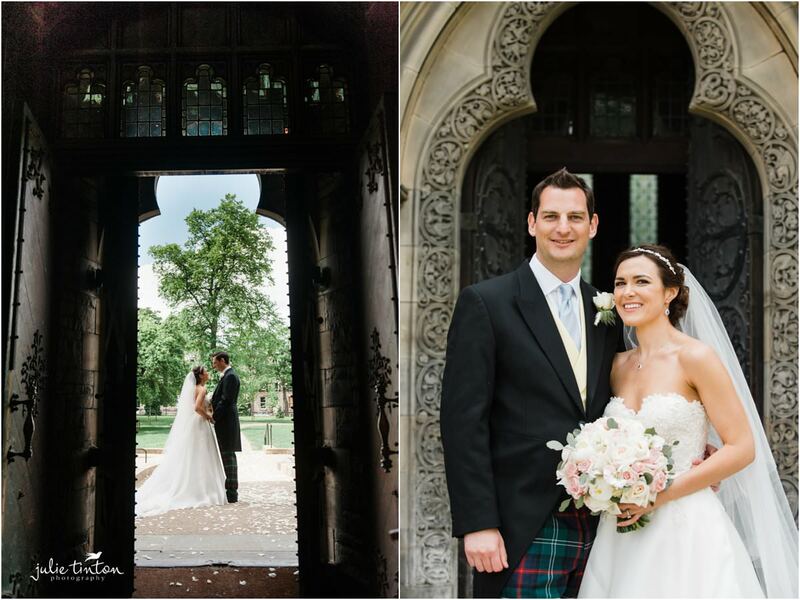 Congratulations Sophia and James on your wonderful wedding day!